Cooking Tips: How to thicken the gravy/curry/stew? We all, some or the other time end up with a thin gravy/curry instead of a thicker version. Here are some tips to thicken the gravy/curry. One of the these will do the trick for you! Mash boiled potato thoroughly & add it to the boiling gravy. Add 2 tablespoons of potato flakes to the gravy & boil it. Mix 1 tablespoon of cornstarch/all purpose flour with 2 tablespoons of water. Ensure no lumps & add it to the boiling gravy/curry. The gravy should thicken slowly. If the gravy is coconut based, then grind together 2 tablespoons of fresh/frozen coconut with 1 teaspoon of rice to a smooth paste. Add this paste to the gravy & boil. You could replace rice with soaked cashew nuts too. 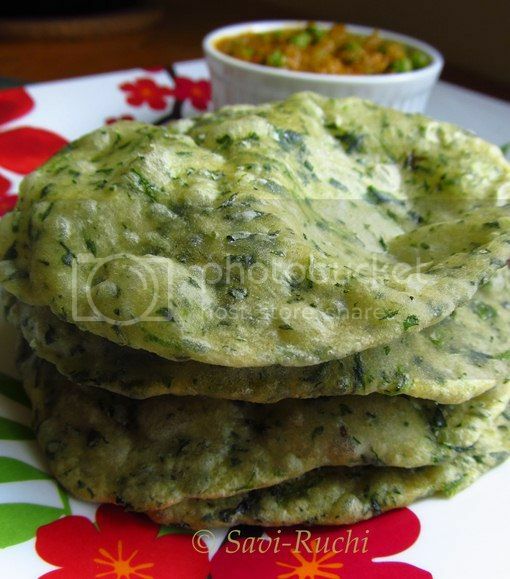 Poori is a deep fried Indian bread made with wheat flour or plain flour/maida. Cooking Time: Around 30 mins to fry all the pooris. Ingredients: (Makes around 20-25 pooris). Methi leaves/Fenugreek leaves/menthya soppu: 3 cubes (I used frozen. 3 cubes is around a cup of fresh methi leaves). Water: 0.75 cups, a little more or less. Around 250 ml of cooking oil. Sieve the wheat flour & maida seperately. Add the sieved wheat flour, AP flour & salt to a big mixing bowl. Mix the flours well. Make a pit at the center of the flour. Pour in the hot oil & mix well until the flours form little crumbs. Now, add in the methi leaves, salt, ajwain, yogurt & mix well. Slowly add water & make a smooth yet stiff dough. Make grape sized balls from the dough. Dust the dough balls & roll the dough balls using a rolling pin. Make around 5 inch circles of medium thickness. Heat the oil in a broad pan. When the oil is hot enough, slide the rolled circles in the oil. Deep fry them on both the sides until golden. The poori will puff up. Remove the fried poori in a slotted spoon. Drain it on a paper napkin. Serve it hot with a side dish of your choice. All purpose flour could be replaced with wheat flour. To check whether the oil is hot enough, take an apple-seed sized dough & slide it in the hot oil. If the dough immediately rises up in the oil, understand that the oil is hot enough to deep fry the pooris. 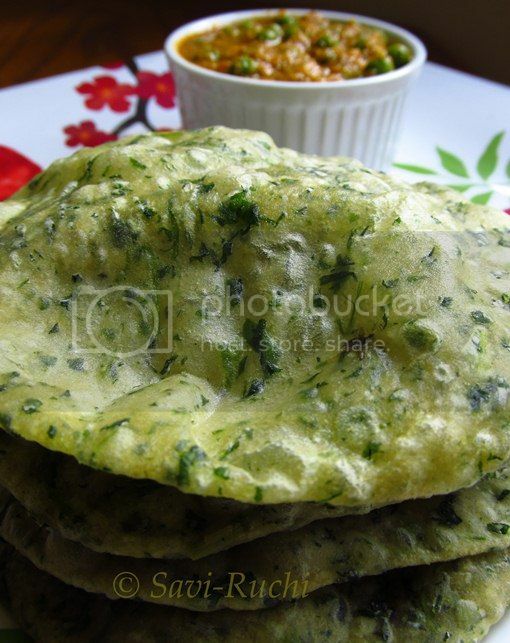 Here are some side dishes that go well with poori. I have mentioned here about my mom-in-law's chutney's. She is an expert in making different kinds of chutney. This is one of the many varieties of chutney she prepares. Bajji is a Tulu word for gojju. 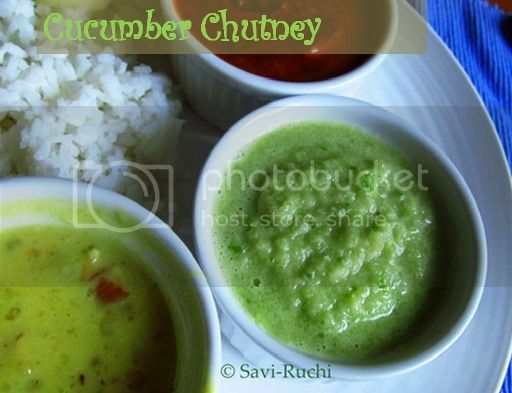 This is a very simple chutney with just 4 ingredients & can be prepared in less than 5 mins! 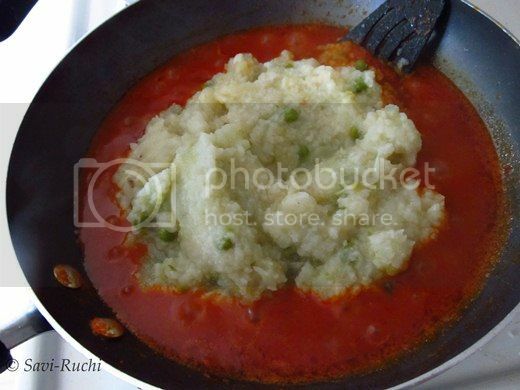 A great side dish for rice, dosa, idli or rotti! Mix all the ingredients mentioned for the chutney. Add little water & make a coarse paste of it. Chutney should not be very fine! Adjust the salt. Scoop it out to a bowl. Prepare the tempering. 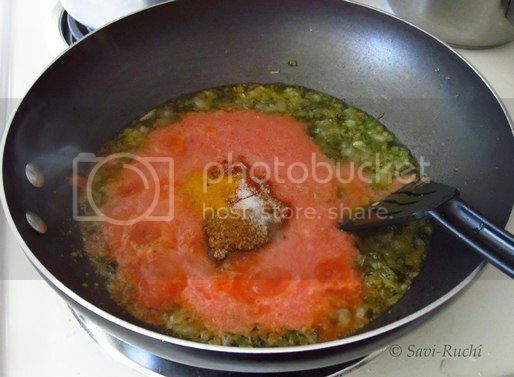 Add oil in a small sauce pan. When oil is hot, throw in mustard seeds, followed by urad dal & curry leaves. When leaves wilt, pour in the tempering over the chutney prepared. 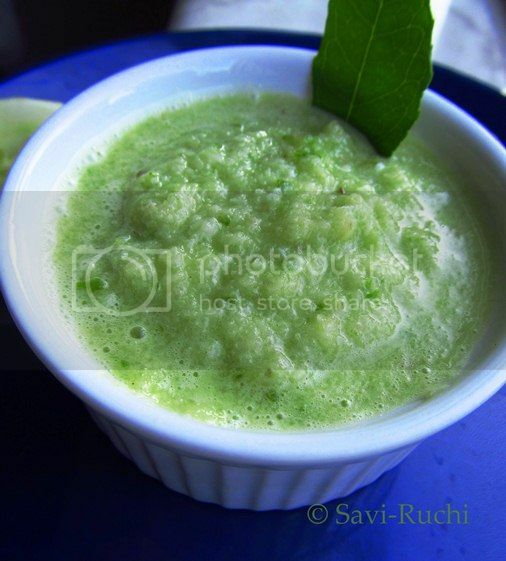 Mix well & serve it with plain rice, idli or dosa! 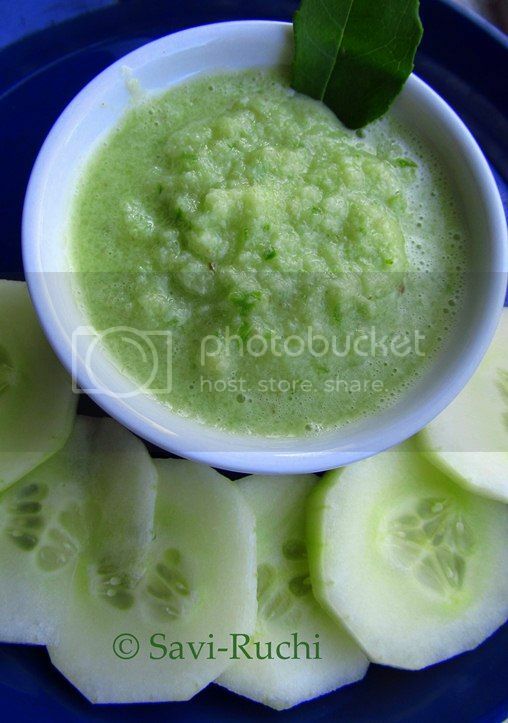 If cucumber is ripened, discard the seeds of the cucumber & then use it, otherwise use as is! 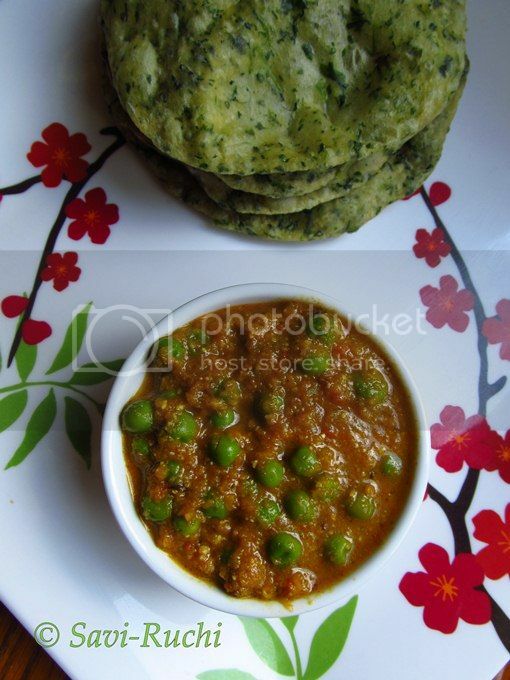 Green Peas Masala: Side dish for poori/roti/paratha. Lots of travel happening this summer !! Had been to New York last weekend; came back tanned & tired! Though the trip was fun, the summer heat drained us to the core. Btw, New York, as rightly said, is a food lovers paradise. We were delighted that there was so many vegetarian options. I tried NY Style Pizza, Pretzels, Gelato & their bagels. After coming back from New York, we went to food coma! I cooked only basic meal with minimum varieties for the next 3-4 days. Time to stop my ramblings & get back to the recipe now! 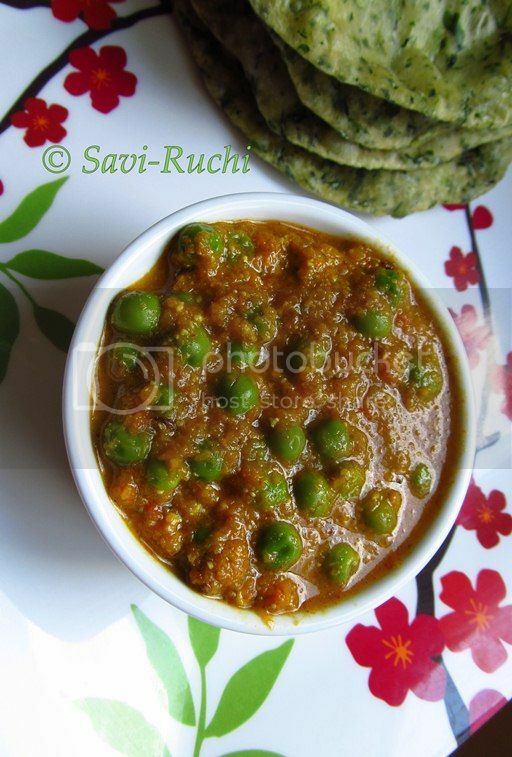 The Green Peas Masala is a great side dish for roti, poori or paratha (or for that matter any of the Indian breads). Make a smooth paste of all the ingredients mentioned for the spice paste. Add enough water to make a smooth paste. Keep it aside. Heat the oil in a broad pan. When oil is hot, add cumin seeds. When seeds turn golden brown, pour in the spice paste. Cook on a medium heat until the raw smell of the paste vanishes. (Takes about 7-10 mins). Keep stirring in between to avoid burning of the spice paste. Add the salt, chilli powder, amchur powder & kitchen king masala to the cooked spice paste & cook again for a couple of minutes. Meantime, thaw the green peas. Add half a cup of water & throw in the green peas.Cook on a medium heat for 5-7 minutes. Remove from heat. Serve it hot with any Indian bread. This recipe tastes best with dried peas. Soak 1 cup of dried peas in water for 4-6 hours. Drain the water. 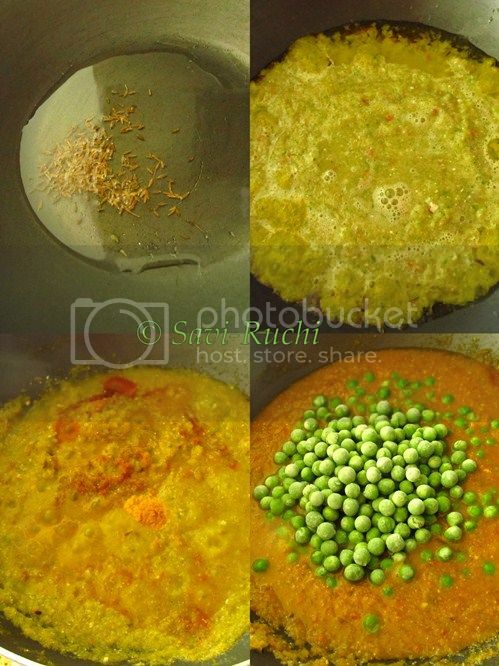 Pressure cook the peas by adding water, salt & turmeric powder. Use this cooked peas instead of frozen peas. One cup dried peas yield 2 cups of cooked peas. The dried peas will not be sweetish like the frozen or the fresh ones! 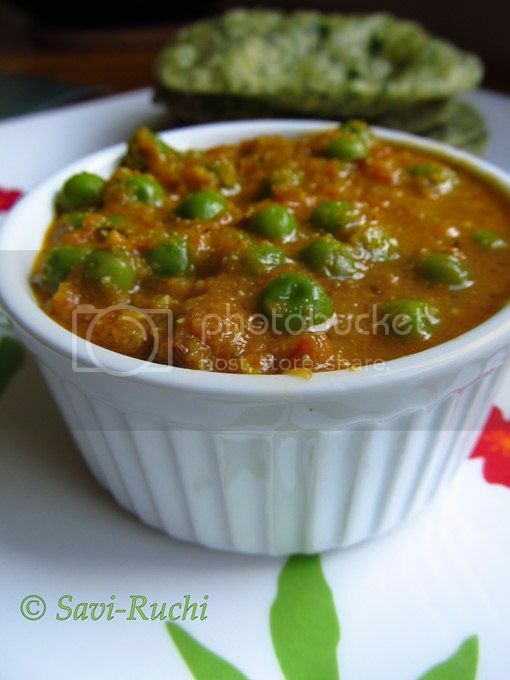 Green peas could be replaced with other beans to make a similar curry. I have memories of my teenage days attached with this dish. No, I was neither born & brought up in Mumbai nor spent even a month in Mumbai. 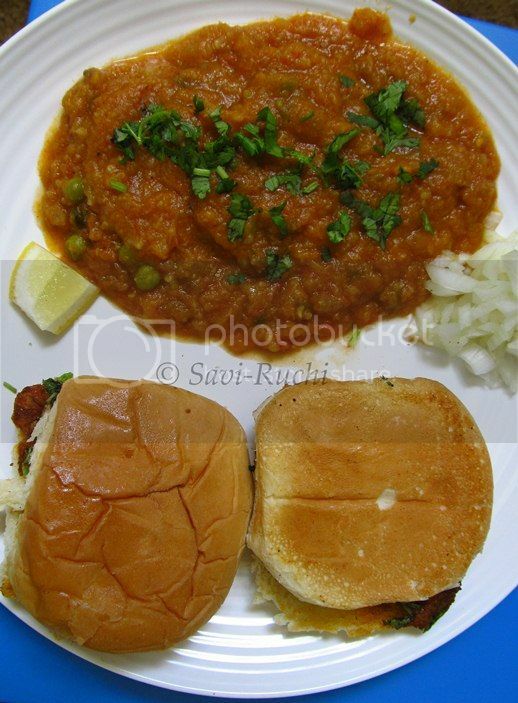 To set the record straight, I have not even tasted Pav Bhaji on the streets of Mumbai! 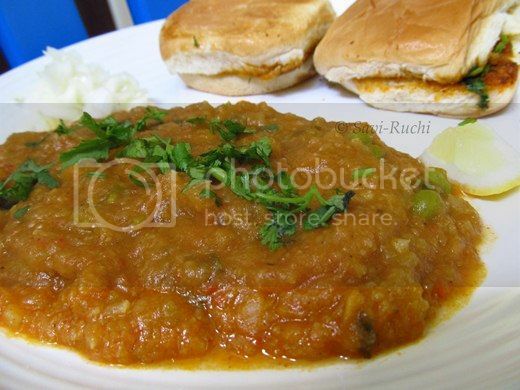 During my high school & Pre University days, I and my cousins used to eat masala puri, paani puri, pav bhaji at my town. I did not know how authentic it used to be but honestly never bothered about it! 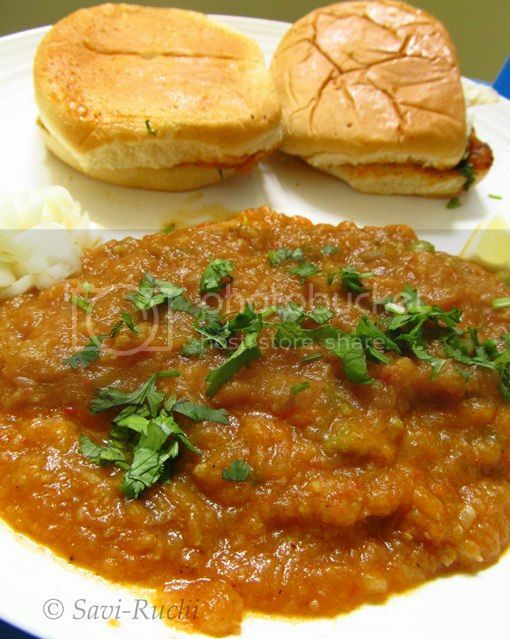 One blue moon day when I went to grocery shopping with my father, I noticed pav bhaji masala. I persuaded my father to buy it for me. He double checked the ingredients (as my mom, grandmom, father are " no" to garlic too!) & finally bought it for me. So, pav bhaji might be my first experiment in the kitchen during my late high school days (of course after maggi!). Roughly chop the potatoes, cauliflower, & carrot. 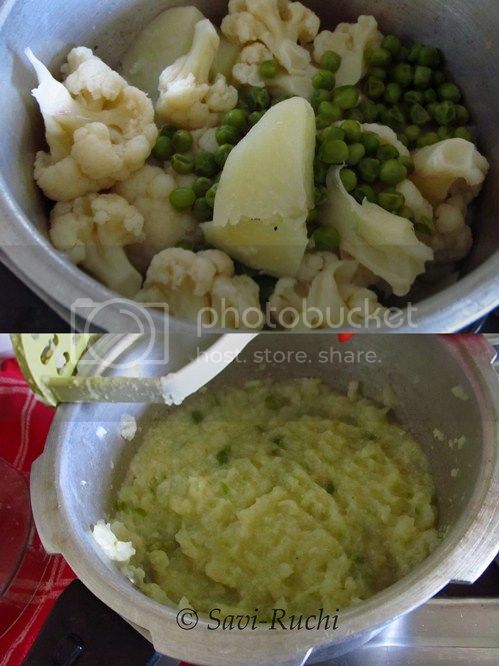 Add half a cup of water & 1/2 tsp of salt to the potatoes, cauliflower, carrot and peas. Pressure cook the veggies for 2 whistles. Meantime, take a broad pan. Heat oil in the pan. 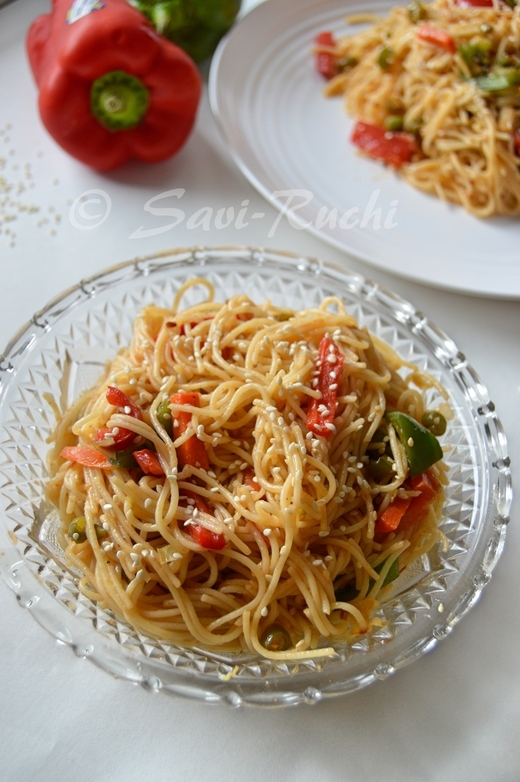 When the oil is hot, throw in the capsicum & saute for a minute. Add the onions & saute until the onions are soft. 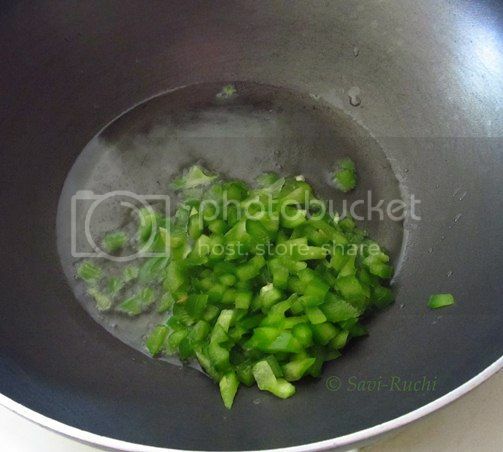 Add the ginger-garlic paste, green chillies & saute till the raw smell of the paste is gone (about a couple of minutes). Add the tomato puree, turmeric, salt & red chilli powder. Allow it to boil for about 5 minutes on medium heat. The mixture starts spluttering, so keep a lid 3/4th covered. Meantime, thoroughly mash the vegetables cooked in the pressure cooker. 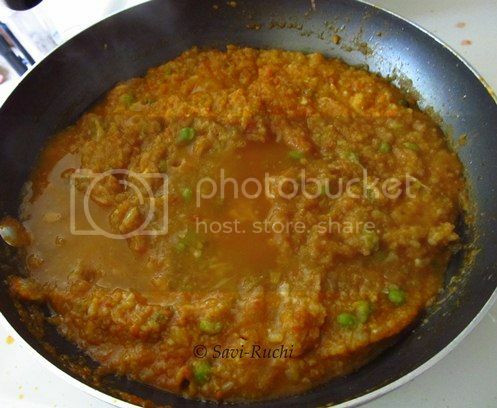 Add the mashed vegetables, pav bhaji masala, half a cup of water & continue mashing, cooking & stirring it. The mixture keeps spluttering all over. So, it is better you handle it with a mitt. Add the butter & keep mashing the mixture. Finally add coriander leaves, lemon juice & mash it for another couple of minutes. Cut the pav in half. Add a teaspoon of butter onto a griddle. 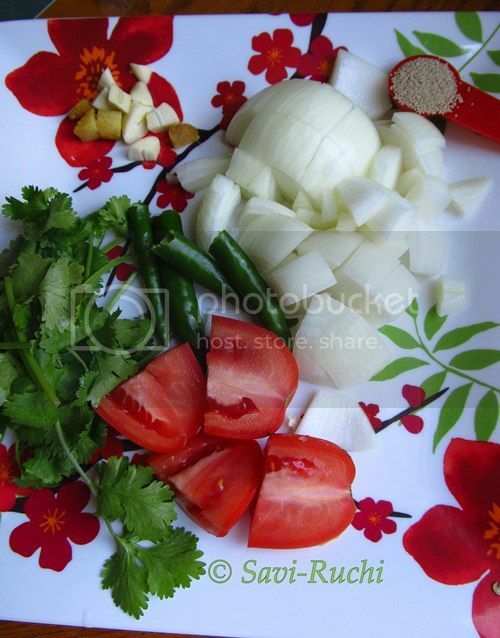 Srinkle some pav bhaji masala, coriander leaves on the butter. Place the pav on the butter & let it get roasted for 30 secs. Flip the pav & roast the other side too. Pour around 1/4th cup or more of bhaji on a plate. 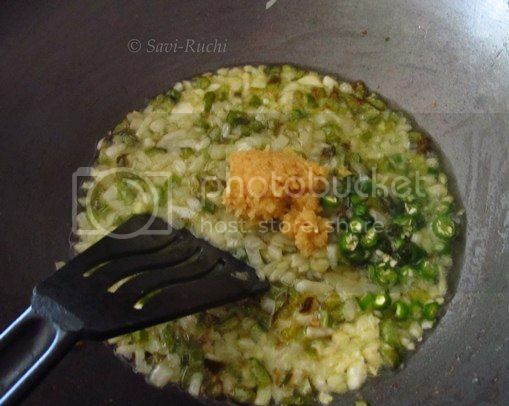 Sprinkle coriander leaves on the bhaji. A blob of butter on the bhaji. 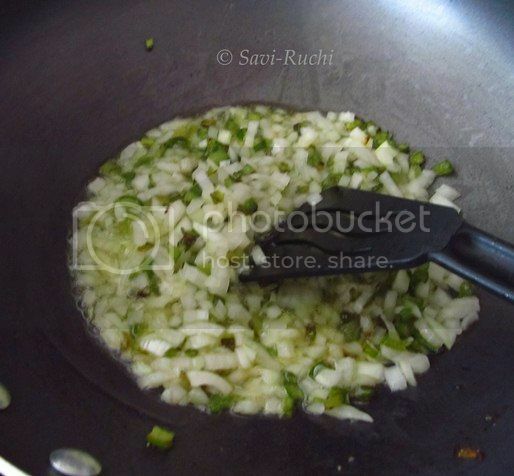 Put around a tablespoon or more of finely chopped onion onto the serving plate. Place a lemon wedge. Finally add the buttered & hot pav to the plate & dig in! One should not be able to find the vegetables that go in the bhaji. It needs to be thoroughly mashed. Be ready to clean the kitchen counter after the bhaji is done, since the bhaji splutters a lot. Be careful while mashing the bhaji too. The bhaji needs to be spicy, tangy & buttery!